It’s not the most logical trend for winter—when snowy winds are stinging your face, who’s thinking about ice cream?—and yet ever since the holidays, soft serve has been at every turn. It started around Thanksgiving at Belly Shack, where Bill Kim is topping the stuff with Mindy Segal’s mint brownies and crumbled cookies. Then, right after Christmas, it showed up at Purple Pig, where the Bannos boys serve three versions: one with olive oil, another with chocolate and hazelnut, and a third that twists the two. 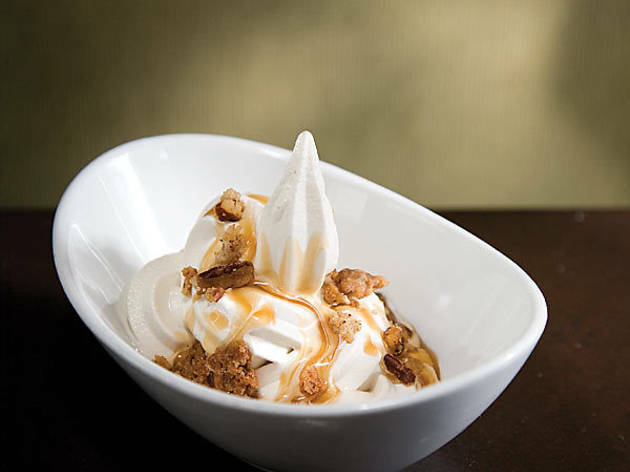 Finally, right after the New Year, XOCO got in the game: Its soft serve, made with buttermilk, lime juice and agave nectar, is topped with either a salted-caramel-pecan-bacon sauce (pictured), or chocolate sauce with pasilla-chile brownies. 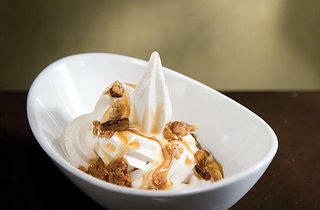 As for the reasons behind the trend, XOCO’s Shaw Lush likens it to the cupcake craze. “When you take that childhood memory”—for Lush it was stopping at Dairy Queen during road trips—“and you apply an artisan approach, the product is even better than what it was when you were a child,” she says. That doesn’t explain why soft serve emerged in cold weather, but we’re not worried about that. If anything, it’s a good sign, because if this is what we’re getting in the cold months, imagine what we’ll get in the hot ones.